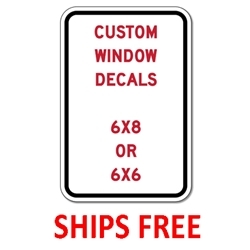 Custom Window Decals - 6x6 - Digitally printed color-fast window decals rated for 5 years. Design your custom window decal and place your order online right now! Be sure to include your email address and phone number during checkout. We will email a proof to you in 1-2 days, so you can see how your custom window decals will look. We will make any revisions you may need, at no extra charge, until you're happy with the look of your decals. After you OK the proof, we'll ship your custom window decals in just 3-5* Work Days!